Movies with people lost in space are becoming something of a trend nowadays. Back in 2013 we had Gravity, an unprecedentedly thrilling cinematic experience using Sandra Bullock's superlative performance as its powerful emotional weight. 2014 offered us Interstellar, in which scientific accuracy was foregrounded in a riveting and deeply emotional story told across galaxies - the main focus might not have been a "stranded in space" story but it was seamlessly worked into the film. The Martian promoted itself as last year's "lost in space" movie, and with two incredibly tough acts to follow, it was already at a big disadvantage. Rooted on a planet and with open communication with earth, The Martian didn't have the absorbing weightlessness or isolated feel of Gravity, nor did it have the fictional worlds or thought-provoking science of Interstellar. The Martian needed to find a way to set itself apart from both of these films, and create something fresh and exciting for a "lost in space" to do. It chose humour. Despite all that Golden Globe controversy, I understand entirely why The Martian was nominated in the Musical/Comedy category. This could have been an overtly serious and heavy handed drama that fell victim to the extraordinarily high standard it was forced to live up to, but Ridley Scott decided instead to pack this film with comedy. And it's a brilliant idea. The Martian is hardly the funniest film ever released, nor is it the most thrilling nor thought-provoking nor gorgeously shot film ever released, but it takes a current trend and sends it spinning in a bold and exciting new direction, and that's all it ever needed to do. The icing on the cake is that all the trends just mentioned - humour, thrills, intelligence and visuals - are all generally handled excellently, meaning this is more than just a new idea: it's a really bloody good one. This film wouldn't be possible without Matt Damon's excellent performance as Mark Watney. Filling this film with comedy had the potential of passing his character off as silly or unintelligent, but Damon's performance - combined with Drew Goddard's fantastic script - does a wonderful job of allowing Watney to be both professional and likable; two traits that are often rarely seen bound to the same character. We are both impressed by his intelligence and his sense of humour, and this makes him a brilliantly easy character to root for. In fact, the acting is generally solid all round. Jessica Chastain is commanding as the group's leader but allows her emotional and vulnerable side to show whenever it needs to, Jeff Daniels is solid in his negativity and Sean Bean's repeated outbursts of rage all hit the mark. It's a film packed with big names mostly performing small roles wonderfully, but this mostly just allows Damon to truly shine. He earns his Oscar nomination and some. The Martian is boosted further by its stunning cinematography and visual effects. The scenery on Mars is a breathtaking sight, and when the film goes into Gravity mode in its impressively intense final act it's all realised beautifully. If I had an issue with the film, though, it's that I wanted it to be braver. The viewer discovers that Watney is alive before any other character besides himself, and I couldn't help but wish that we stayed isolated with him for a lot longer. Damon proves in this film that he is more than capable of commanding the viewer's attention by himself, so it's a shame that we don't get to spend an elongated period of time with him before we return to Earth. It also slightly impacts the film's dramatic weight, too. Watney is stranded for a hell of a long time, and it's unfortunate that it doesn't really come across due to how quickly and repeatedly we cut back to Earth; his isolation is never truly felt. Still, this is a minor hiccup in a generally excellent film that, whilst not really exceeding the quality set by others in its field, does a seamless job of trying something new and absolutely nailing it. 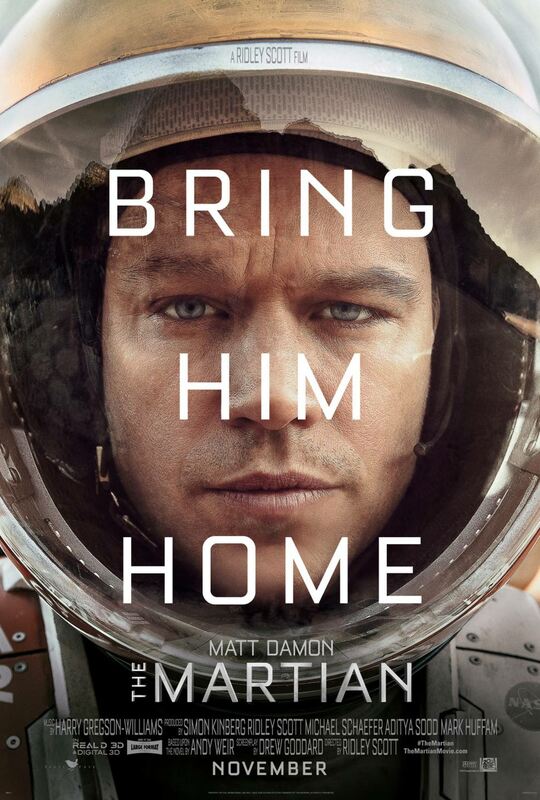 The Martian attempts to be funny, dramatic, intense and emotional. Not only does it achieve all four, but it does it in space, on Earth and on Mars simultaneously. Now that is something worth hailing. To Summarise: Carried by a terrific script and Matt Damon's impressively enjoyable performance, The Martian is a bold, fun and exciting adventure in space, bolstered further by breathtaking visual effects and top notch direction from Ridley Scott.